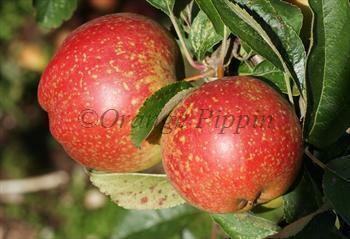 Cornish Aromatic is a high-quality late-season dessert apple from Cornwall, with an attractive red / russeted skin. In a good year the flavour can be excellent - a rich pear-drop note to the firm flesh. Please fill in the details below and we will let you know when Cornish Aromatic apple trees are back in stock. Cornish Aromatic is in flowering group 2. Cornish Aromatic is self-sterile and needs to be pollinated by another tree of a different variety nearby. Cornish Aromatic is well-suited to the mild wet climate of the Cornish peninsula, and is generally a good choice for areas with wet climates because of its natural resistance to scab, a disease which is more prevalent in wetter areas. However to get the best flavour try to plant it in a spot that gets maximum sunshine. Known from Cornwall, England, early 19th century, but probably older.